It's almost universal knowledge that teeth often succumb to the ravages of dental disease, whether tooth decay, gum disease, trauma and more. 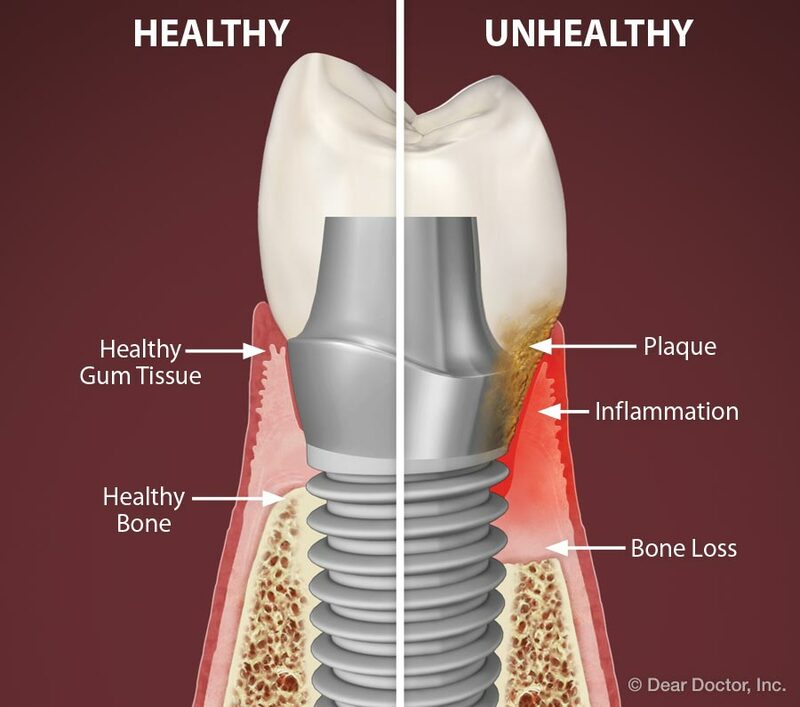 But did you know that dental implants — tooth root replacements upon which new crowns are placed — are also prone to disease of the tissues that attach to, and surround them? In fact, inflammation and infection of the surrounding tissues that support implants is perhaps the greatest cause of concern today regarding implant failure. It is generally referred to as peri-implantitis ("peri" – around; implant "itis" – inflammation). The first phase of peri-implantitis is a condition in which the gum tissues surrounding the implant become inflamed or infected. Also referred to as peri-mucositis, inflammation of the gum or lining membranes of the mouth, this most commonly results from (bacterial) biofilm, but also can result from excess dental cement (used to attach a crown) that is not completely removed. If inflammation/infection is limited to the gum tissues, then improving oral hygiene and cleaning to remove dental biofilm and any excess cement can generally manage it. Deeper-seated inflammation/infection extending into the bone destroys the connection to the implant — the all-important osseointegration ("osseo" – bone; "integrere" – attachment). This is much more problematic; it undermines the support for the implant, and hence the tooth root and crown that it replaces. This is what is referred to or diagnosed as peri-implantitis. Peri-implantitis often has the usual signs of inflammation: redness, swelling, bleeding and suppuration (pus formation). In more severe cases, bone loss can be rapid and ultimately the implant can loosen and be lost. It has been speculated, and there is some evidence to suggest that individuals who had prior aggressive periodontal (gum) disease, which resulted in their tooth loss, may be at greater risk for peri-implantitis. Don't get too worried; dental implants have the highest success rate of any tooth replacement system — around 95% — so only a small percentage develops problems. The good news is that peri-implantitis can be treated successfully if caught early enough. It requires control of the inflammation/infection with local cleaning or antibiotics. In more advanced cases, attempts at surgical repair may be necessary to regain attachment and bone. The biggest problem here is decontaminating the exposed implant surfaces, which are microscopically roughened by the manufacturer to aid attachment to the bone. This creates hiding places for bacteria. If an implant is lost due to peri-implantitis every effort should be made to preserve the surrounding bone and replace the implant. Prevention pays great dividends in avoiding implant failure. Once the implants are placed, the ball is largely in your court. It's crucial to maintain a good oral hygiene routine. Make sure you have regular professional dental check-ups and cleanings to help keep the tissues around your implants healthy.